In April 1945, some 1400 civilians and soldiers rebelled against the Nazi regime. Initiated in Munich by the Freiheitsaktion Bayern, the uprising has been largely forgotten. A historian at LMU has now published a comprehensive study of it. On 28. April 1945, many listeners in Southern Bavaria were startled to hear a call to “Get rid of the functionaries of the National Socialist Party” emerging from their radio receivers. The appeal for a popular uprising against the Nazi regime was broadcast by a resistance group called Freiheitsaktion Bayern (“Action for the Freedom of Bavaria”), which was largely made up of soldiers of the Wehrmacht and military interpreters. The group’s objective was to topple the Nazi power structure and form a provisional government. Many people spontaneously responded to the call. However, the insurrection was unsuccessful, and 57 persons were later put to death. “In the final phase of the war, the regime turned on the civilian population, on its own citizens,” says Ferdinand Kramer, Professor of Bavarian History at LMU. Historian Veronika Diem has now produced the first detailed study of this little known episode, based on her doctoral research. 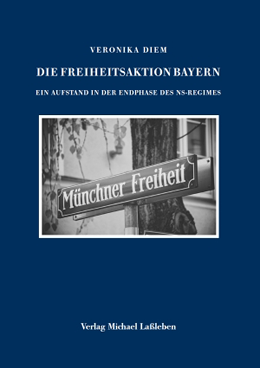 Her dissertation on the Freiheitsaktion Bayern (subtitled “An Uprising in the Final Phase of the NS Regime”), just published by the Verlag Michael Laßleben, has already received this year’s Dorothee Fliess Prize for Resistance Research. “It has only recently become clear that the insurrection was long planned, and that many of those involved had been connected with active opposition to the regime for even longer. Strikingly, some of the participants had had contacts with the American Secret Service,” Ferdinand Kramer remarks. Notably, the Bavarian uprising of April 1945 marks the first use of radio to initiate a revolt. Veronika Diem was able, for the first time, to make use of the personal papers of one of the protagonists involved in the rising, as well as records from public archives all over the world and post-mortem reports. Her work revealed that 440 soldiers were directly involved in the actions carried out on the night of 27/28. April, far more than had been previously thought. In addition, almost 1000 soldiers and civilians responded to the appeal put out by the Freiheitsaktion Bayern. The most important goal of the local actions was to put an end to senseless attempts to hold up the advancing American forces. As Veronika Diem emphasizes: “All of the participants were taking an enormous personal risk.” After the failure of the rising, many of the participants were summarily executed by Nazi supporters.